I'm usually a sucker for movies about old guys trying to recapture their youth. I'm the target audience, after all. For the first half, that's the sort of movie THE WORLD'S END is, with a group of middle-aged British guys including Simon Pegg (who co-wrote the script with director Edgar Wright, as usual), Nick Frost, and Martin Freeman, trying to recreate the legendary pub crawl they attempted when they graduated from school twenty years earlier but failed to complete. It's funny, poignant, and works really well. Then the plot takes a bizarre, abrupt, science fictional turn, and that works pretty well, too, although I liked the first half better. It really does feel at times like you're watching two different movies. 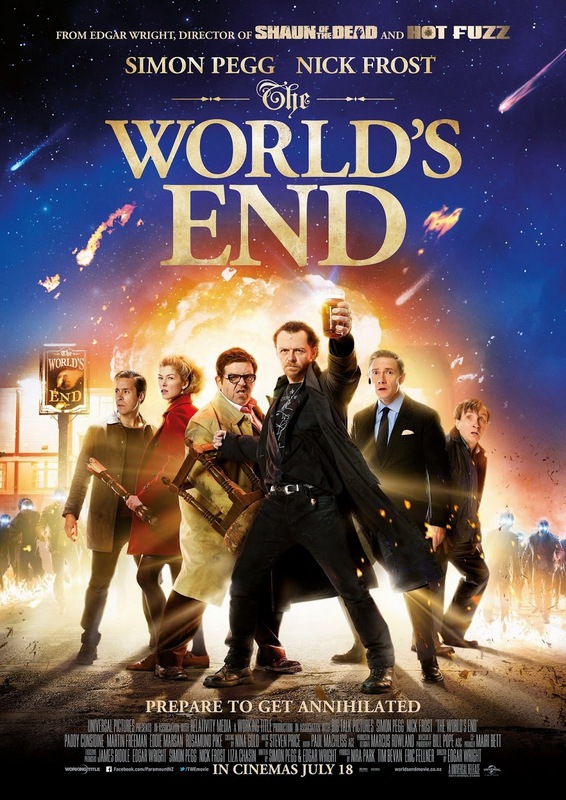 But if you enjoyed Pegg and Wright's earlier movies like HOT FUZZ, SHAUN OF THE DEAD, and PAUL, you'll probably like THE WORLD'S END, too. I did. There was a slew of apocalypse comedies about then, of which the most successful, THIS IS THE END, was the worst by some distance. Some of the best were, sadly, flops, and this one (much like SHAUN, did pretty well). "Then the plot takes a bizarre, abrupt, science fictional turn, and that works pretty well, too, although I liked the first half better. It really does feel at times like you're watching two different movies." It sure did. It was a bit jarring for me, and I was already on the fence about the film at that transition point. After that, it picked up some for me, but I'm still not yet sure it's a film I'd recommend. It did, though, have just enough charm thanks to Pegg/et al that I probably would. Haven't seen it yet, but there's a used copy languishing on the shelf of my dvd store. I liked Shaun... wasn't so keen on Hot Fuzz, it had real nice attention to detail in the script, it didn't capture the style it was aping quite as well as Shaun. Yes, it is Cornetto, Todd.